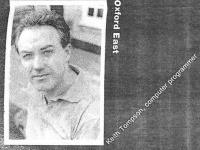 Keith Tompson (Keith Teare) as RCP candidate in the Oxford East constituency in the 1992 General Election as featured in Break out of the grey: Election manifesto of the Revolutionary Communist Party. In the mid-90s, with the RCP heading more and more in its new pro-technology, pro-enterprise direction, Teare helped set up a series of internet business ventures, including Cyberia, Easynet, and CScape. These were mostly headed by and employed other RCP-ers. Teare then went on to become a Silicon Valley tycoon, enjoying a roller coaster romp through the boom years of the new economy bubble. Teare isn't your typical Valley boy. For starters, he grew up on a council estate in Scarborough in the early Sixties, the only child of six to go to university (Kent, to study political science and sociology). Afterwards he set up the London-based Workers against Racism and rallied against British involvement in Northern Ireland. He published a book critical of the treatment of immigrants in Britain under a pseudonym, so that the National Front wouldn't get him. 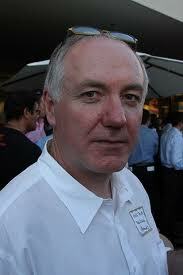 Working for a small publishing company in 1981, he was put in charge of the computing system. He had never encountered a computer before. "I got completely obsessed," he says. By 1986 he had translated his obsession into a database and software support company, which he set up with his brother Brian. The Internet service provider Easynet came later, in 1994, shortly followed by the chairmanship of Cyberia, the Internet cafes. Centraal grew from Teare's experiences with exporting Easynet services to France. While trying to give Easynet subscribers access to Minitel through the Web, Teare hit on the idea of simplifying the Uniform Resource Locator (URL) system to allow users to type in a simple keyword which would link them to the appropriate Web site without the need for complicated dots and slashes. He e-mailed his idea to Jean Marie Hullot, who at the time was the chief technical officer of Steve Jobs' NeXT Software. "Hullot e-mailed me back with one word, 'Wow,' and I took that to mean that he wanted in," Teare recalls. By the end of 1996, Teare and Hullot were ready to launch Centraal, using some $3m of private finance, much of which Teare raised from the sale of his stake in Easynet. In spite of the fact that Hullot insisted on remaining in Paris, Teare chose to locate his start-up in Silicon Valley. In Teare's extraordinary journey there seems to be a kind of metaphor for what happened to the RCP. Keith is the CEO and founder of Edgeio corporation is a silicon valley startup focused on building an online classified advertising network. edgeio has about 6000 listings advertisers submitting listings that appear on edgeio.com and over 1000 additional publisher web sites. Mr. Teare was the founder of RealNames, a Palo Alto based company specializing in Internet navigation and search technologies; co-founder of The EasyNet Group, a leading pan-European broadband supplier to businesses; co-founder of CYBERIA, the worlds first Internet Cafe and founder of cScape, a UK based systems integration specialist dating back to 1983. Mr. Teare is an advisor to SnapNames; Spotplex; Snipperoo; AboutUs.Org and Real Time. Keith Teare, The Easy Net Book, International Thomson Computer Press, June 1996. This page was last modified on 6 July 2017, at 11:59.